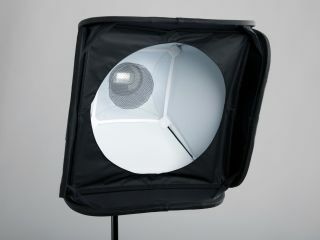 Lastolite, the backgrounds and lighting systems manufacturer, has announced the launch of a new £100 Strobo Beauty Box. The box is a 38cm (15 inch) beauty box and softbox combination designed for off-camera flash. The white interior combined with the suspended inner baffle and outer mask give off a hard beauty light with a unique fall off. The company says that this is in contrast to the soft light that is created when the mask is replaced by the outer diffuser, giving two different lighting options within the same product. The Beauty Box is also collapsible and portable, as well as being designed for a quick set up and take down. The box is designed with studio and location photography in mind, and can also incorporate the Exybox Hotshoe Bracket MkII. The Strobo Beauty Box is available now for an RRP of £100.